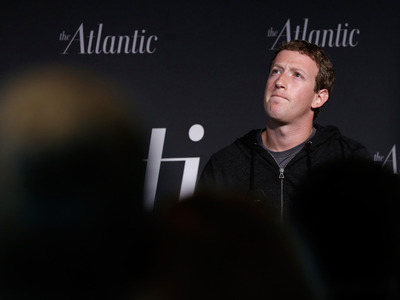 Win McNamee / Getty StaffFacebook CEO Mark Zuckerberg speaks at the Newseum September 18, 2013 in Washington, DC. Facebook’s spate of recent issues show that it is exhibiting signs of “systemic mismanagement,” according to Brian Wieser, a senior analyst at Pivotal Research. Analysts’ concerns thus far were mostly limited to the slowing down of digital advertising growth for Facebook, as well as rising costs. But now, they are looking at Facebook in a new light, cautioning investors that there may be “operational problems” at the company. Facebook’s stock dropped 9.5% over Monday and Tuesday, wiping out around $US50 billion off the company’s market capitalisation. The stock is trading up slightly on Wednesday. Facebook is exhibiting signs of “systemic mismanagement,” according to a new report published by Brian Wieser, a senior analyst at Pivotal Research. “What has come to light with the past week’s revelations potentially represents a different class of problem when put in context with other issues that have arisen in recent months,” Wieser wrote in a note to investors Wednesday. Wall Street analysts have mostly been concerned with the potential slowing down of digital advertising growth for Facebook, as well as rising costs due to the company looking to combat recent issues by hiring content moderators and investing in increased vetting of partners and advertisers. Research company eMarketer, for instance, recently predicted that the US digital ad market share of Google and Facebook would fall for the first time in 2018, shrinking to 56.8% from 58.5% last year. Facebook’s role in the distribution of fake news, racist uses of the platform, and its data management law violations in European markets like Germany and Spain among others, should have either been “prevented or “otherwise obviously better managed,” Wieser says. When it only sent a letter to the policy violators in August 2016 after discovering that Cambridge Analytica and other entities extracted data from users in a manner that violated its policies, without any follow-up or without disclosing the leak. With its string of major measurement snafus, which have continually affected advertisers’ planning efforts adversely and added to buyers’ frustrations over the years. With its retaliation against the BBC when the BBC reported photos of child abuse on Facebook to the company in March 2017, where it reported the BBC to the UK police for distributing the content that existed on its platform instead of tackling it. Its initial denial and then admission that its self-service advertising tools were gamed during the US 2016 Presidential elections, and that it had unwittingly facilitated these alleged crimes. While these missteps may be attributed to the company’s explosive growth, Facebook should have made responsible managerial choices to ensure that sufficient processes were put in place to check them, he said. “We are unable to think of another company which has had as many operational problems as those which Facebook has experienced over the past few years,” Wieser said. Weiser’s note adds to a growing body of Wall Street research published in the past few days that asks whether the Cambridge Analytica scandal represents a “fundamental risk” for the company. Wieser acknowledged that while Facebook had addressed some of these problems, and would presumably address the rest, investors have to consider how it evaluates itself. Facebook could conclude that it has grown in a manner that has proven to be untenable, which would depress the size of the company. Or it could arrive at the conclusion that it needs to significantly improve how it is managed, which means that it could see personnel changes at some point in the not-too-distant future, he said.